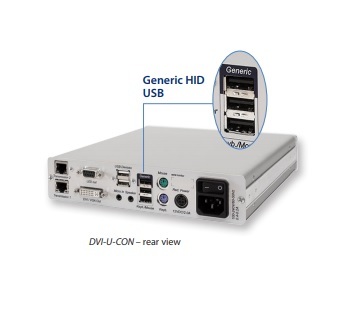 The DVI-U Con allows transmitting DVI / PS/2 / USB Audio signals via one transmission cable to the central module from distances up to 140 metres. With the "U" variant it is possible to transmit transparent USB without any additional devices. There is no need for additional cables or devices. This solution achieves a transmission rate up to 16 Mbit/s. For higher rates you need the U2-R-CON modules..
With the "U" variant it is possible to transmit transparent USB without any additional devices. There is no need for additional cables or devices. This solution achieves a transmission rate up to 16 Mbit/s. For higher rates you need the U2-R-CON modules.